Tamworth Town Hall is located at 84 Main Street, Tamworth, NH 03886; phone: 603-323-7971. Photo: Chocorua River, Town of Tamworth, New Hampshire, photographed by user:Hossen27, 2006, en.wikipedia.org, accessed June, 2001. Tamworth, founded in 1766 — and the area first settled several decades earlier — is rich in historic structures and sites. State historic markers alert travelers to a number of significant sites and events. The Barnstormers Theatre is the oldest summer playhouse in NH, and one of the oldest in the U.S. The Chinook Kennels moved to this site in 1930, and operated for decades producing champion dogs bred for exploration and racing. The Chocorua Legend relates the tragic tale of the deaths of Chief Chocorua and his son and conflict with local settlers. The marker is located near the lake on Route 16. Historic sites also include a number of buildings and a historic district. The Cook Memorial Library was established in 1796 by the Reverend Samuel Hidden, the fourth social library founded in New Hampshire. The current library building was constructed in 1895 and was listed on the National Register of Historic Places in 1980. The Captain Enoch Remick House was built in 1808. It is significant as an agricultural property and for its architecture and interior wall paintings. The Chocorua Lake Basin Historic District encompasses more than 5,000 acres of land around Chocorua Lake and includes historic summer cottages and primary residences. The Chocorua Grange was originally part of the Gilman Tavern. It housed the Tamworth Historical Society from 1961 until 2007. It is now privately owned. It was added to the New Hampshire State Register of Historic Places in 2002. The Tamworth Historical Society stimulates interest in the history of Tamworth through the collection and display of articles of historical value and the dissemination of information. Founded in 1952 by a small group of volunteers it is dedicated to preserving the history and traditions of Tamworth. 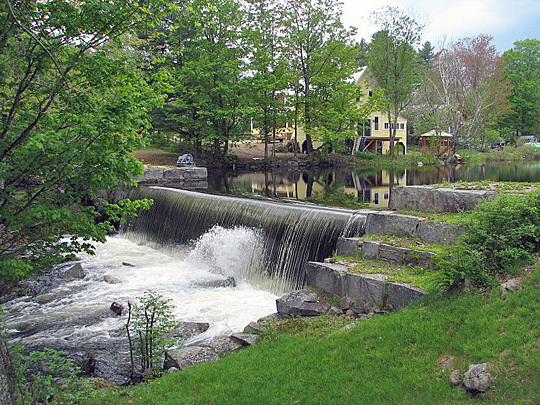 Tamworth Master Plan, Chapter XII, Cultural and Historic Resources, 2008. www.tamworthnh.org, accessed June, 2011.